"Sean has never before in his life taken a photo in a public washroom nor will he ever do so again. He just happened to have his camera in his pocket when he entered the washroom down the hall from his office. The washroom was completely empty, and hardly a soul was in the entire building. He saw the above sign and thought it just HAD to be recorded and discussed on his blog. That is the ONLY reason he took out his camera in the washroom. Seriously." 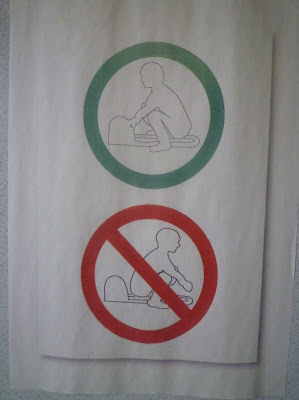 That out of the way all I can say is: Oh my, how I did laugh when I saw this posted on the door to the Japanese-style toilet in the bathroom down the hall from my office. Readers in the western world may not be familiar with the one aspect of Japan that, more than any other, strikes fear and terror into the hearts of foreigners here: the hole-in-the-floor squat toilet. The first 3 years I lived in Japan I had the misfortune of working at places that only had these kinds of toilets. I just hated them. Within a few months I had scouted out alternative venues in nearby fast-food outlets and vowed never to use one of those....those.....those "things" ever again. So anyway, that means I never use the toilet which has the above sign posted on it. I do, however, know that the sign didn't used to be there and seems to have only appeared in the past few days. I also know that I feel REALLY bad for the cleaning staff of my building, which hosts classes for foreign students studying the Japanese language during the week and I assume we have them (or at least ONE of them) to thank for the sign's existence. Suffice it to say that misusing the facilities in the way indicated in the picture with the red circle can have disastrous consequences. I do not want to know what the culminating incident was that drove the staff to put that sign up, but it was accompanied by a rather harshly-worded admonition that was obviously penned by someone who had been pushed past their limits. Whatever they are paying those people, it isn't enough.